West-facing villa. Close to several prominent golf courses. Off plan contemporary style. Aesthetically very pleasing urbanisation. Boasting spectacular panoramic sea views. Design your own project. Wide choice of façade styles, room and floor arrangements and materials. Solarium area with golf and sea views. 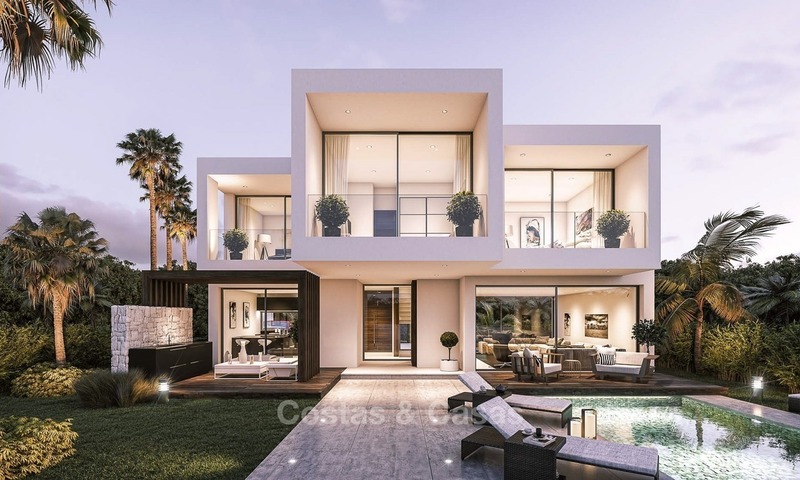 Luxury new development of 11 modern villas located frontline golf, in a 24-hour secured gated golf and Country Club estate. Each villa has uninterrupted views of the Mediterranean Sea across to the north Coastline of Africa. 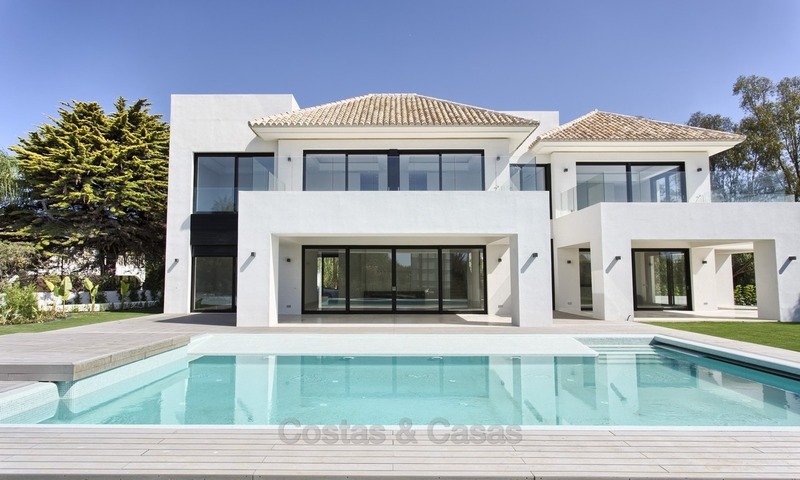 Lovely villa, all on one level, located in a very nice residential area on The New Golden Mile, between Puerto Banus and Estepona, at the beach side of the A7, at walking distance from the beach, restaurants and shops. LAST VILLAS! 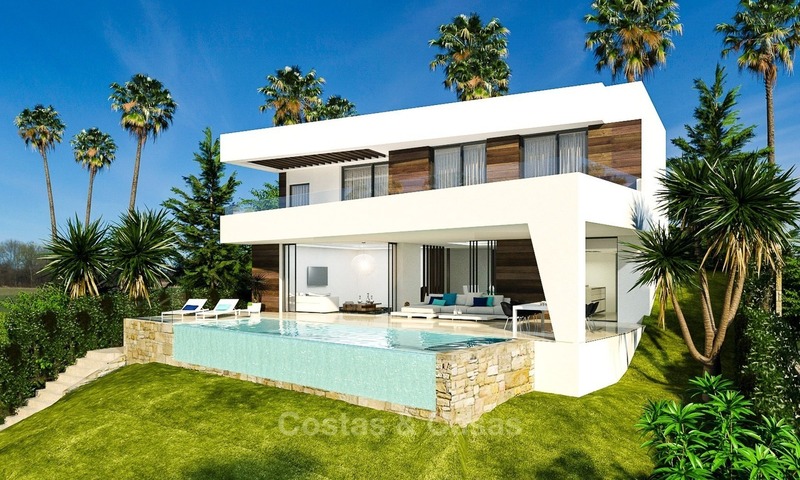 A unique new development of 12 luxurious villas with contemporary design, set first line golf. At walking distance from the beach and a lovely Clubhouse with Spa, gym, outdoor and indoor pool, restaurant, chill out area with fire place, tennis courts and amenities. RESALE VILLA WITH EXTRAS. 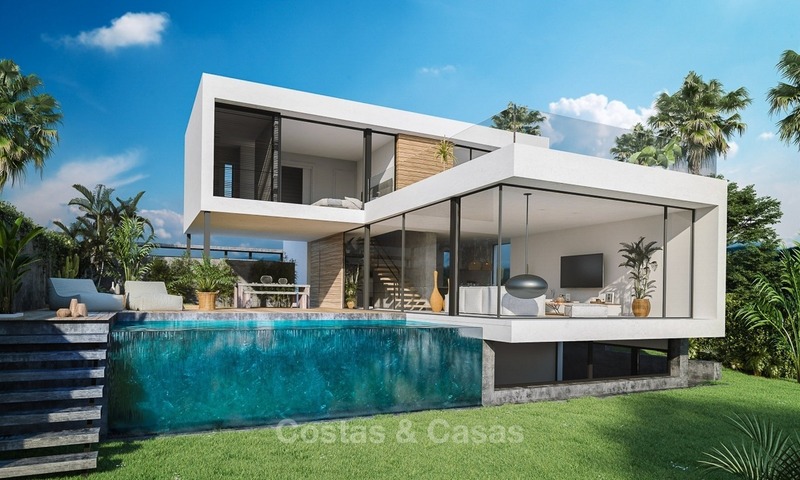 Designer villas all with modern amenities, sea views, South East views of the sea, and all within a prestigious community later to be made up of a further 8 villas and within walking distance of the beach, local shops and only a 10 minute drive from Puerto Banus and Estepona. 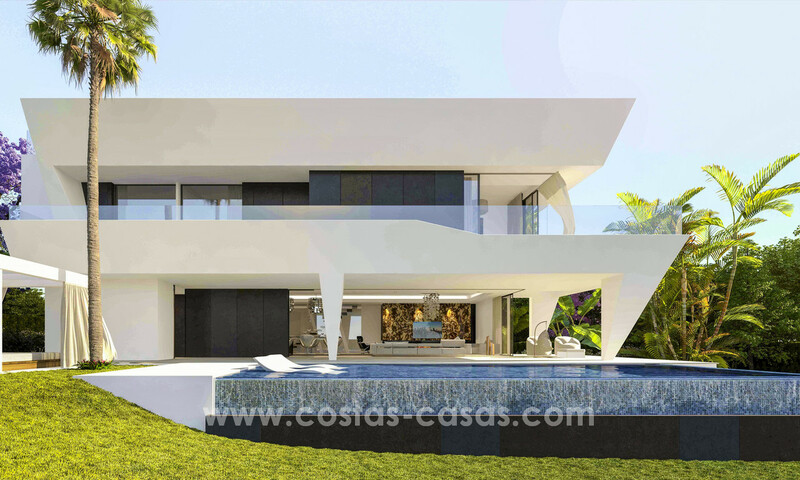 The three-bedroom villas are among the most attractive and best-located modern homes in Marbella, offering optimal comfort and luxury in a contemporary setting, with a bedroom suite on the ground and two on the first floor. 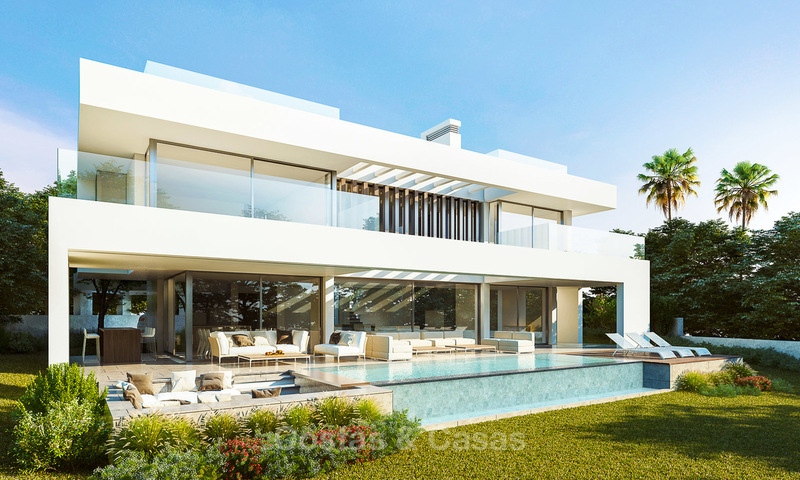 The villas offer an open plan layout with large windows with concealed rails in the floor in the living area to combine the inside space with the spacious terrace to create one large open space. The villas are south facing. Each house has direct access to the beach and is at a short walk to amenities. Spectacular and panoramic views of the sea to Gibraltar and Africa. South facing. Refurbished. Update. Spacious new villa, south to south-west facing. The villa is located in a very nice residential area, at walking distance to the beach, golfcourse and amenities. 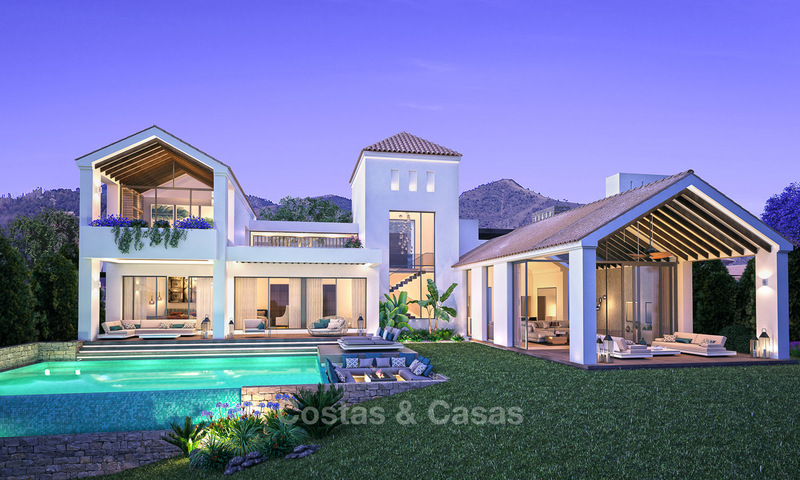 Modern new villas in a gated resort at walking distance to the beach between Marbella and Estepona centre.